Welcome to the FSMTA Musicians Wellness webpage! Our purpose is to serve you as a resource in promoting the health and wellbeing of musicians and music students. Awareness of the importance of wellness among music students has been growing steadily over the last several decades. Studio music educators are in a strategic position to help promote the health and wellness of their students—but many teachers have not received instruction in these areas through traditional pedagogy. This webpage provides access to resources and training that can help to fill this gap, including links to resource lists, articles, webinars, and related websites. You will also find information about upcoming wellness events, both within and outside the state of Florida. It has been exciting to witness many different fields and disciplines coming together to help promote health and wellness in musicians and music students. We want to be one more link in this growing chain of support. Please don’t hesitate to contact us with questions, concerns, or ideas—we can accomplish much more together than alone. 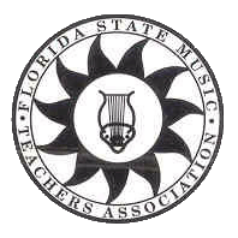 Music Teachers National Association has taken a major leadership role in musicians’ health and related areas since the mid-1980’s. MTNA’s pioneering and ongoing commitment to musicians’ wellness and prevention education has resulted in the formation of the MTNA Wellness Forum in 2008, initiation in 2014 of a wellness track as part of pre-conference Pedagogy Saturdays, establishment of a series of articles on musicians’ health in The American Music Teacher beginning in 2014, development of online resources on the MTNA website, and numerous other initiatives. Many state affiliates, including FSMTA, are actively involved in implementing this mandate from MTNA to assist music teachers in promoting health in music making. State conferences have frequently featured numerous workshops on health-related topics, and both district and local affiliates have been engaged in similar efforts. The formation of the FSMTA Wellness Committee marks a significant step forward in this progression. Slides presented by Dr. Eckart Altenmüller, neuroscientist and keynote speaker at the MTNA Conference in Orlando, Florida, March 18, 2018. National Conference on Keyboard Pedagogy Wellness Curriculum, revised in 2007 by members of the NCKP Committee on Wellness for the Pianist.